Does there a soul who will never ever wish to become stylish? That too in this era of the fashionable-cosmopolitan life. I bet no…. Yeah! Everybody wants to be stylish… Let it be a school kid! He too often finds something to make him noticed amongst his classmates. You might have seen kids craving for a water spraying umbrella. What is there in it? Nothing great. As we know umbrella is all about protecting from rain, a good shade. Then what about this prototype…. Which instead of covering sprays water even if it is not on its master? It’s all about staying unique and moreover staying in the trend. The world is now moving on a sense of style -it is creativity, an imagination and a choice. There are mentors the great artisans who develop the trend by introducing their concepts. Now, to be stylish we can sort for the easiest way. Of course it won’t be an umbrella, how would a person wait for the next monsoon to show off his/her style?...... Impossible …….It’s now or never…. according to me, the best way to establish your persona is your outfit which is your daily choice. Now man is moving from the tucked stereotypes to free shabby dressing code, yeah… that is his choice may be the most soothing, the most apt. But there is something somewhere signaling , If all follow a trend then what is there unique in it, everyone the same ? .Why can’t we sort to be mentors for ourselves, why moving behind the trend .Yes find out something that make you unique ,try your style ,it’s better to lead than follow . May be I could give you the best. Imagine the beauty of night, the glittering twinkling stars, and the shining moon, what about such a galaxy in our 6 yard traditional drape ?, of course I love it and so as you if my pre -assumptions are correct . No doubt it will be fantastic and worth viewing may be the ever done awesome choice. 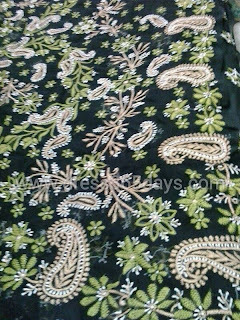 The black chikankari is there to real up your dreams the perfect trace of the beauty of twinkling stars or the glowing flowers on the dark black elegant background. Let it be a marriage function, a college party, or a farewell it will be a best choice if wore with a silver or light combination. The woven threads whisper the hidden beauty in each of its tie ups which will make you attractive and noticed. There is often a belief that mullet colored or dark toned people should not were black, but to the contrary I would suggest you to go for the black chikankari combination as it will never project you odd or fade you with when worn. Whereas the dark background will enhance your beauty and the woven magic will sort more combinations to choose in about the miscellaneous accessories like earrings, rings, anklets etc. You may select a pair of black roses as your earrings if you sort for the flower embroidered type or a silver heart or star when in star embroidered drape. 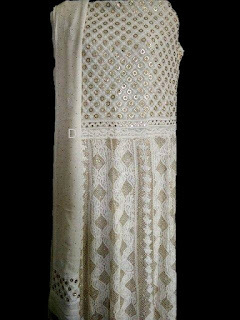 Yet we have a lot more, our collections of chikankari are not limited but vast and vivid which might surprise you and make you feel the beauty of the real incredible Indian works. It is obviously a culminations of such marvelous awesome collections , works on aqua blue, leaf green, blood red and simple peace white to make you look more pretty and may be the prettiest . Let this be resolutions for today, your style …try varieties – chikankaris the best!